"Newsweek" magazine once asked Henri Cartier-Bresson, the great French photographer considered to be the father of modern photojournalism, during an interview to name his favorite film. 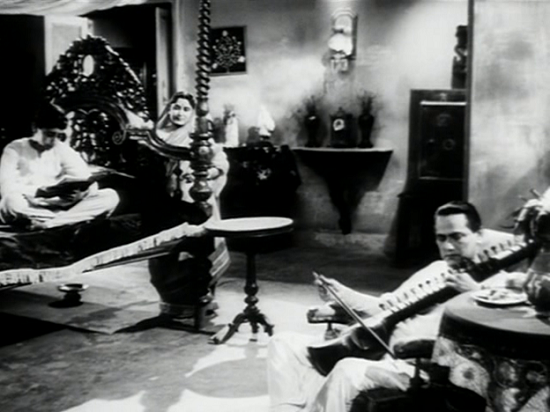 Bresson replied - "Satyajit's Ray's 'The Music Room'. An old film but one that made an indelible impression on my mind." The French film fans were so excited about this film that it had an uninterrupted eight months run in a cinema theatre in Paris, as the famous film critic Derek Malcolm states in a 1982 interview with satyajit Ray. 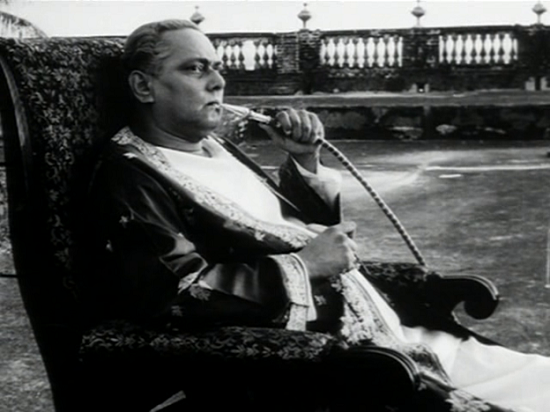 "The Music Room" is a film that led to greatness by Satyajit Ray’s devotion to a single mood: elegiac. Ray isn’t alone in sculpting this great piece. 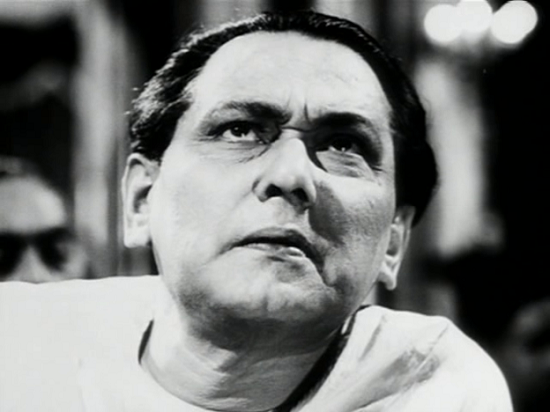 The acting by Chabi Biswas as the crumbling aristocrat Huzar Biswambhar Roy, cinematography by Subrata Mitra and music direction by Ustad Vilayat Khan all contribute immensely. 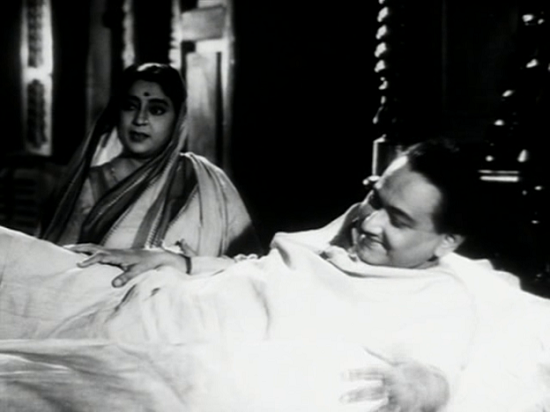 The film is an adaptation of Tarashankar Banerjee's short story but instead of creating an exact adaptation, Satyajit Ray gave his own spin to the film, making music, rather being an interlude, an integral part of the screenplay. "Jalsaghar or The Music Room" examines the age-old conflict between the landed nobility and the un-pedigreed rich, between those who dwell in the past and those who embrace the future. Using the same meticulous, unforced style employed in his celebrated "Apu Trilogy", Ray explores how one man's need for a pampered, sumptuous lifestyle leads inexorably towards his complete ruin. It's a fascinating snapshot of Indian culture in the 1930s, and a cautionary tale about the dangers of an inflated opinion of self-worth. Set in the 1930’s with the emerging nouveau riche, Roy is the last in a long of rich patriarchs, stumbling as his estate diminishes but clinging till the end to his refined means. Roy lives in a mansion in the middle of a desert, a symbol of his isolation from encroaching destitute. Roy is frequently filmed alone, as are other subjects (his dog, horse and elephant). The film begins with the elderly Zamindar (landlord) sitting alone, staring blankly in his back garden overlooking a once proud space. He is served by one of his two humble and loyal servants. The story flashes back some 15-20 years to a more glorious time when the younger Huzar, with his young son Khoka and wife Padma (the realist/pragmatist to Huzar’s idealism) was the class of his region, hosting luxurious concerts in his home. Huzar’s centerpiece, his ivory tower and final refuge from the external reality/realism is the titular music room. The room reflects the Huzar's pride, his heirloom, his inner soul. Ray draws us in spatially, in concentric circles, from the outer oasis, to the backyard pool/yard, to the mansion, to the music room and further yet, the music room’s stage. Likewise Mitra’s camera often, and nearly always in relation to Roy, dollies inwards toward Roy. The movement not only serves to honor the character and make us feel more empathy toward him, but counterpoints the film’s maze-like construction. Though Biswambhar Roy has the title, he has none of the perquisites, inheriting diminishing lands that are being eroded by the neighboring river. But he must maintain the lifestyle of his heritage. This splendor is most apparent in the grandest room of his mansion, the music room. Here he brings the finest musicians and dancers to perform, and invites the area's most important commoners. His wife's entreaties to control spending are ignored, and the puberty party he throws for his son bring him down to the last few sacks of family jewels. Then, struck by the tragedy , he locks the music room and slips into lethargy - until a final grand soiree consumes the last of his funds. Many of the film’s best moments take place in the music room. For example, the first concert during the flashback, in which the camera encircles Roy surrounded by his guests and cuts into the long takes only to underscore Roy’s sense of tranquility and contentment; the concert which is interrupted by the tragic news of his son and wife’s drowning; and the final concert, Roy’s swan song which leads to his psychological break from reality into momentary insanity (he imagines the candles in the room extinguishing themselves one by one). In each of the concerts the music varies. In the first we have more of an ensemble piece; in the second the singer dominates with his emotive voicing; and a phenomenal dancer highlights the third. The final concert occurs years after Roy, saddened by the double deaths of his wife and son and his failing estate, has closed the music room and remained living on the mansion’s second floor. With all his gold, silver, and jewelry gone all that remains is a little money. He uses it to stage one final concert. Roy’s continued carelessness toward his economic state can be read in several ways. If we read it critically, it becomes a sign of his selfishness and disregard for his family’s well-being. 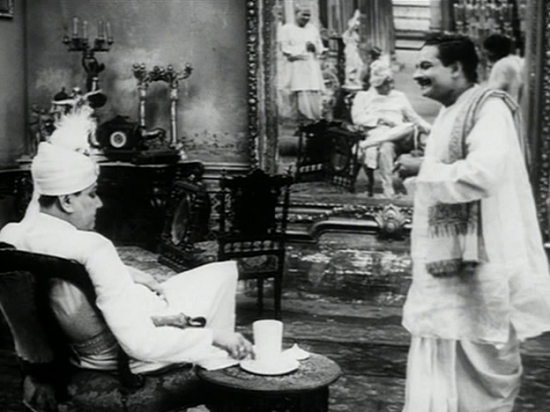 In another sense his gesture can be seen as an act of defiance against the upstart moneylender who is out to show Roy up, and a romantic tribute to the truly elegant men who lived - “the class of class.” A third meaning, psychological, one can see the acts as a reflection of how deeply ingrained the caste system and colonialism are in India. When the drunken Roy explains to his servant why he is different from Tulsi, the estate manager, he speaks in English and refers to his “blood,” and then points to the three portraits of his ancestral forefathers (father, grandfather, great grandfather) that hang around the music room’s huge mirror. Ray’s genius is in balancing these three readings so that our emotional relation to the character is complex and in a sense more critical and involved. The film ends with the drunken-maddened Roy, against the wishes of his servants (servile to the end), riding his horse for one last jaunt through the desert. Roy is thrown violently off his horse. The servants run to their fatally hurt, bleeding master. With the earlier death of his son and now himself, his rich, aristocratic lineage has come to an end. In this touching moment, Ray has the camera track away (left) from the body to stop at his fallen headgear. This image dissolves to the final shot: that of the darkened chandelier swinging aimlessly in the darkened music room. 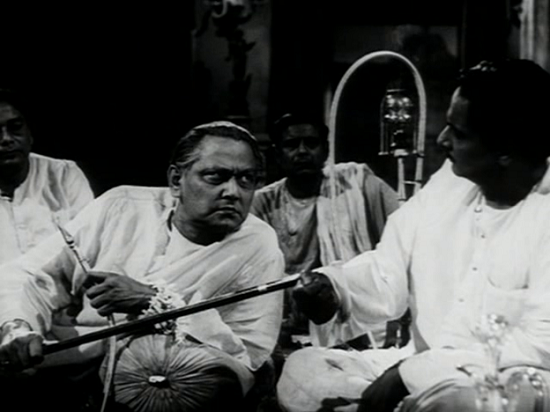 Chhabi Biswas gives a superb performance as the crumbling feudal landlord. 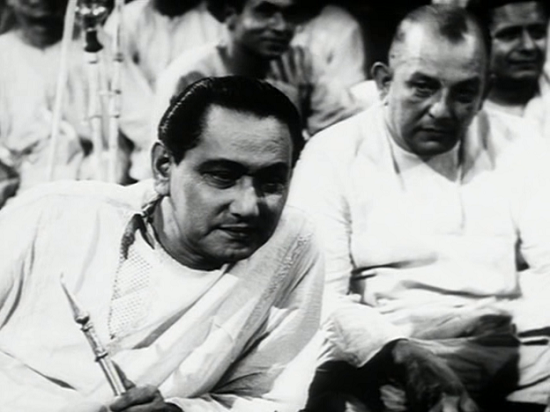 Subrata Mitra's cinematography and music by Ustad Vilayat Khan all contribute immensely to create the atmosphere. "Music Room" is a very visual film - there are numerous ingenious shots (the insect dying in the glass, the bliss of an elephant being bathed in the river, the joy of the servants reopening the dusty music room, the way the chandelier gets reflected in the wine glass revealing Huzur's states of mind, and the last scene where a spider crawls up the leg of his own portrait) and a stirring dance sequence. 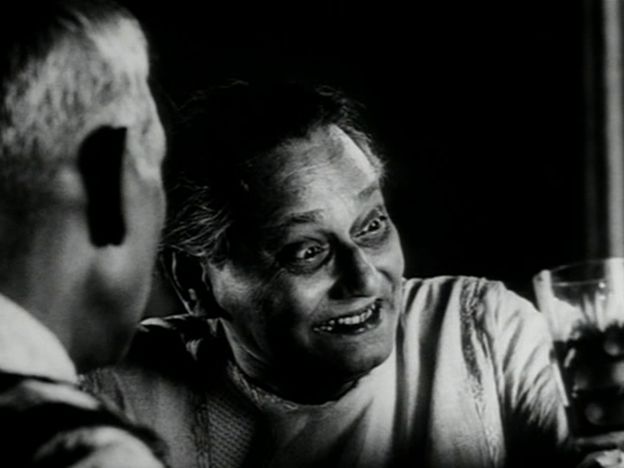 The camera movements reinforce the character and highlight film's maze-like construction and Roy being trapped in his past. "The Music Room" is the tale of a man's monumental effort to cling to his illustrious legacy and hold his head high when his feet wither.